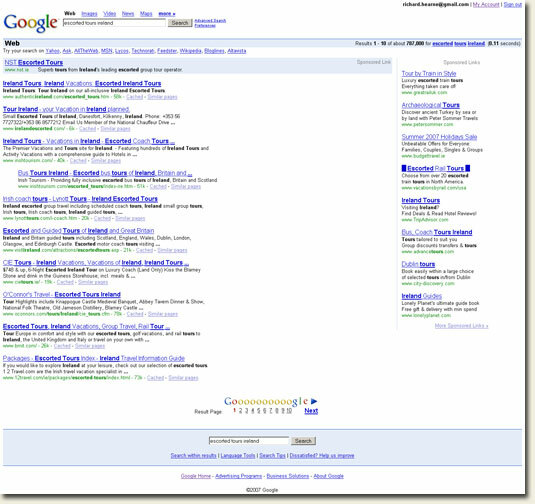 Using ASCII to Cheat Adwords – Which Of These Ads Grabs Your Attention? 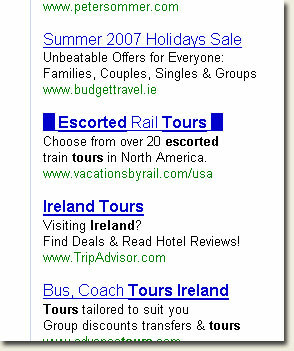 I noticed this ad group while searching on ‘escorted tours ireland’. Notice anything odd? What are the bets that third ad gets a higher CTR than the two above? They’ll stamp that out pretty quick! Very smart though, whoever thought of it. The ad more than likely has not been reviewed yet. Lets see if this lasts more than 24 hours. And the prize goes to Mr. Dave Davis. It appears to be gone now. I think Google should allow this in some circumstances. I saw that in the last few days. Very creative, but imagine if everyone started doing it. And everyone would start doing it if Google allowed it. It’s against TOS. Dont expect to see much more of this.